I’d be lying if I said I’ve always been inspired to try my hardest because of the example set by Dorothy “Dottie” Kamenshek. In fact, I only learnt about her this past week, during a google search, for which I’m extremely grateful. Now that I’ve read several, if not every article written about her, I’m not just appreciative—I’m inspired by this sportswoman who was single-minded and passionate about baseball. 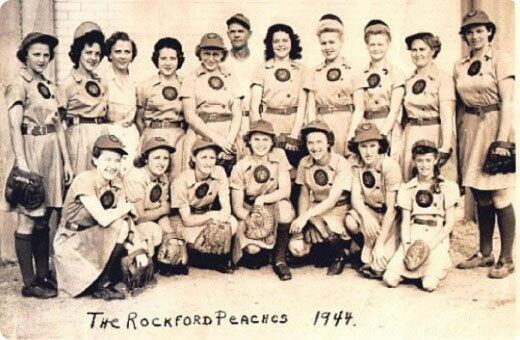 In 1943, ‘southpaw’ Dottie was 17 years old when she joined the Rockford Peaches, which was part of the “All American Girls’ Professional Baseball League”, established to keep the interest in baseball going during WW2. 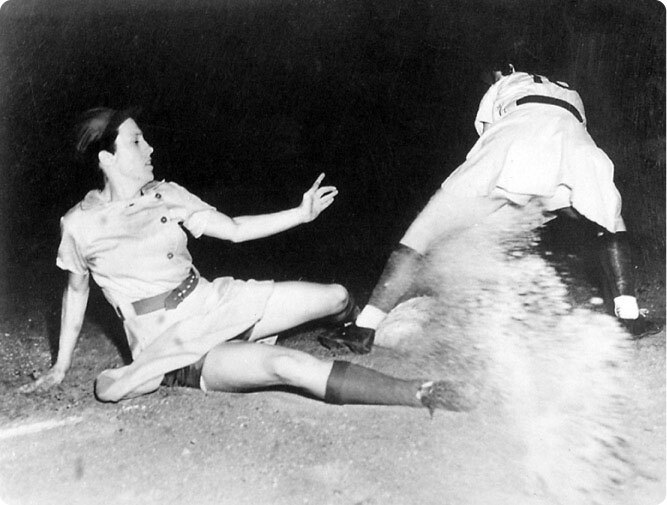 Women’s leagues became popular attractions in the ’40s and ’50s; the fans first came just to see the girls—then they started coming to watch some serious baseball, with a fan base that numbered 1 million in 1948. One simple rule: Play like men; look like girls. As to Dottie’s attitude about the DRESS code, she said they just had to get used to it and try to develop callouses, or get their skin toughened up in order to deal with the constant abrasions caused by sliding into base on bare legs. Dottie didn’t have any trouble, for the most part, with keeping the rules, as she was so fanatical about practicing. And the practicing paid off—she led the league as the best hitter in ’46 and ’47 (for you baseball fans, her average was 3.16 and 3.06, respectively). She also stole 657 bases during her 10-year career, including 109 in 1946. Not just an outstanding hitter, she was an excellent first basewoman—described by Wally Pipp (New York Yankee) “as the fanciest fielding 1st basemen I’ve ever seen, man or woman”. She’s listed in the 1999 Sports Illustrated among the Top 100 athletes of all time. A men’s baseball team in Florida offered her a position, but she turned it down since she thought it was just a publicity stunt. Her last year of playing was in 1953, wearing a back brace because of an injury—still managing to steal 63 bases. After baseball, she obtained a degree in physical therapy and worked as Chief of Therapy at Los Angeles County Children’s Services. The All American Women’s League ceased to exist a year after Dottie retired. The All American League and Ms. Kamenshek were all but forgotten until a 1988 exhibit included a display about them in the National Baseball Hall of Fame. 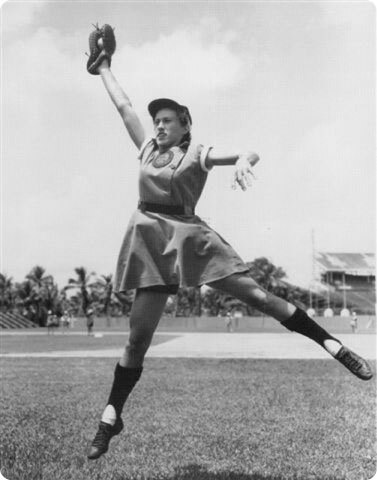 Dottie was also one of the athletes to inspire the character of ‘Dottie Hinson’, played by Geena Davis in ‘A League of Their Own’. Now, why do I find Dottie’s story inspiring? Not only do I enjoy a good game of baseball, I admire a person—man or woman—who is passionate about whatever they pursue. Plus, she persevered, was single-minded (fanatical) about practicing to get to be at the top of her profession, didn’t get side-tracked by man-made rules; then when she retired, used her abilities to help children become stronger.